Stand quietly away from the main road beyond the wall and take a close look. Although the bustling social life within the walls faded long ago, it can still be heard today. The Baroque murals have been covered by dull and sterile paint, but they can still be seen. The garden no longer abounds with a bright palette of colours and tropical fruit, but you can still catch their fragrant scent. 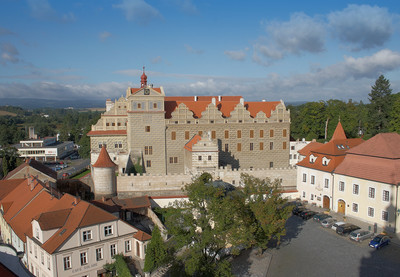 Červené Poříčí Château is waking from a long slumber and is waiting to be discovered anew.